Mumbai: Private equity firm Blackstone Group LP on Monday sold an 8% stake in its portfolio company Mphasis Ltd for about Rs1,440 crore. Blackstone sold a total of 15.2 million shares through its unit Marble II Pte Ltd, bringing down its shareholding in the Bengaluru-based information technology services provider to 52% from 60%. Mphasis is India’s single largest pure-play private equity firm till date. The shares were sold in a bulk deal at Rs960 apiece to Aberdeen, Oppenheimer and US money manager T Rowe Price. The price is more than double the buying price of Rs430 paid by Blackstone. In September 2016, the buyout major had bought a controlling stake in Mphasis for Rs5,466 crore ($816 million) from Hewlett Packard Enterprise (HPE). This was followed by a mandatory open offer for the acquisition of a further 26% shares of Mphasis from public shareholders at Rs457.54 per share. However, the open offer did not go through as very few of the public shareholders tendered their shares. Hewlett Packard Enterprise inherited the controlling stake in Mphasis when it bought IT consulting company Electronic Data Systems in 2008. “Blackstone is committed to remaining a long-term majority shareholder of Mphasis and retaining control of the company. Today’s block was strategically executed to create more liquidity in the stock and enable high quality long-term investors to participate in the Mphasis growth story. Blackstone does not currently intend to sell any additional stake," said a spokesperson for Blackstone India. 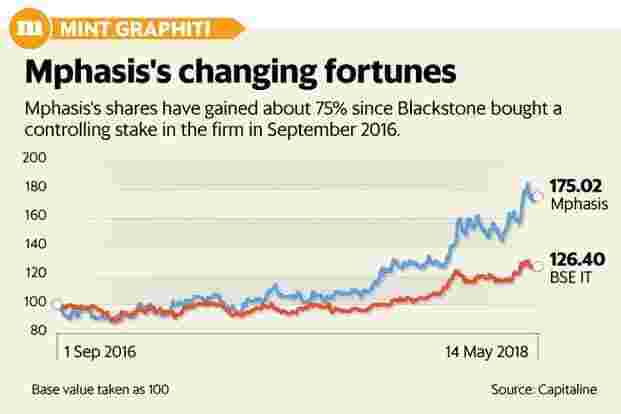 Blackstone is not expected to offer more shares for sale in Mphasis in the near future, the spokesperson said. On Monday, shares of Mphasis closed 0.08% higher at Rs985.45 apiece; while the benchmark Sensex gained 0.06% to close at 35,556.71 points. Blackstone has partly or completely exited several of its Indian investments in the last few years. In 2015, Blackstone sold 57% in India’s largest cash management firm CMS Info Systems Ltd to Baring Private Equity (Asia) for about $250 million. In May last year, Blackstone sold a 7.5% stake in fragrance maker S.H. Kelkar and Co. Ltd for nearly Rs334 crore through an open market transaction. Blackstone had earlier sold a 10% stake in the company in its IPO in November 2015. In 2015, the buyout major sold its 97.9% stake in Agile Electric Sub Assembly Pvt. Ltd to Igarashi Electric Works Ltd of Japan and MAPE Advisory Group Pvt. Ltd for about $106.4 million. Earlier in March this year, Mint reported that Singapore-based real estate company CapitaLand Ltd and global investment firm Xander Group Inc. are the front runners to acquire Pune-based IT Parks, which is owned by Blackstone. Blackstone has also put its BlueRidge special economic zone (SEZ) and another IT SEZ in Hinjewadi area of Pune on sale, the Mint report added.